Note the bolded passage above: despite the media hubbub, by condemning “lobbying by [homosexual] orientation,” Pope Francis essentially disqualifies ALL pro-homosexual (“gay rights”) advocacy and legislation. Pope Francis has said gay people should not be marginalised but integrated into society. 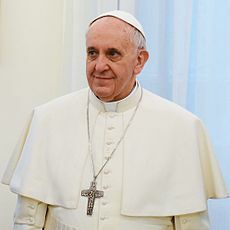 Speaking to reporters on a flight back from Brazil, he reaffirmed the Roman Catholic Church’s position that homosexual acts were sinful, but homosexual orientation was not. He was responding to questions about whether there was a “gay lobby” in the Vatican. He also said he wanted a greater role for women in the Church, but insisted they could not be priests. The Pope arrived back in Rome on Monday after a week-long tour of Brazil – his first trip abroad as pontiff – which climaxed with a huge gathering on Rio de Janeiro’s Copacabana beach for a world Catholic youth festival. Festival organisers estimated it attracted more than three million people. His remarks on gay people are being seen as much less judgemental than his predecessor’s position on the issue. Pope Benedict XVI signed a document in 2005 that said men with deep-rooted homosexual tendencies should not be priests. But Pope Francis said gay clergymen should be forgiven and their sins forgotten. Distortion 1: Most media outlets are suggesting that Pope Francis is somehow saying there is nothing wrong with being gay. “If a person is gay and seeks God and has good will, who am I to judge him?” he asked, according to a Vatican Radio English translation of his remarks. Understanding the Catholic teaching on homosexuality is necessary to understand the meaning of this phrase. Distortion 2: Since the context of the quote is in a discussion about a clergyman who is alleged to have been involved (as a priest) in a homosexual affair, the implication is that the Catholic Church is okay with gay priests. Firstly, the Roman Catholic Church opposes any sexual activity by priests since they vow celibacy. Distortion 3: Never judge and never discriminate. A few quotes from the Pope strung together would also leave a faulty impression without a knowledge of Catholic teaching on the matter. In addition to the ‘who am I to judge’ quote some media are translating one phrase of the Pope to say that there must be no discrimination against homosexual persons, and that they must be accepted. The Catechism is specific that “unjust” discrimination is to be avoided, but the Church also teaches specifically that there is proper discrimination to be applied when it comes to confronting homosexual actions and tendencies. Firstly as noted above, the ban on homosexuals entering the priesthood is already discrimination, a proper discrimination. Also in this 1992 Vatican document, the Catholic Church spells out other areas where such discrimination is needed, specifically in the areas of adoption, foster care, teaching, the military, and more. This article was posted on Monday, July 29th, 2013 at 11:59 pm	and is filed under "Sexual Orientation"/"Gender Identity" and the Law, Catholic, Catholic general, Catholic Pro-Family, News, The Bible, Churches, & Homosexuality. You can follow any updates to this article through the RSS 2.0 feed.